I have a guinea pig problem. When I see one of these furry, sturdy little animals I want to squeeze it. Not hard but in the same way you feel that irresistible urge to pinch a chubby baby's pink cheeks. Maybe it's the happy face of this rodent or their solid bodies but my husband, L., knows that if we go to a pet store to pick up puppy chews that I will invariably make a beeline for the guinea pig cages and stay there mesmerized hoping that an attendant is nearby to let me hold one. This did happen. Once. L. and I were in a pet shop back east and the attendant happily took out a chubby little brown and white Holstein-looking guinea pig and handed it me. I remember her feeling like a warm little potato in my hands. I bit my lip to avoid squeezing her, looked over at L. and he knew what I was thinking. He immediately called the girl over and said "OK. You need to take her back NOW." That was the last time I held a guinea pig. And then two weeks ago I discovered ETSY. Oh. My. Gosh. This site is spectacular and addictive. It's just this incredible universe of creative people selling their hand-made designs. I looked at aquamarine earrings and paintings of cantaloupes and I don't know how I discovered this gem, but I did. And I just about lost my mind. Look at her face! I saw this watercolor and I started to laugh. I just felt good. Looking at this painting made me happy so I bookmarked it and revisited it. A lot. And I went back a week later to buy it and it was gone. Damn. I emailed the artist, Jen Klimas, and the listing had expired. She kindly re-listed it. I went from being so bummed out that I missed out on buying this funny little painting to being overjoyed that she was not sold. So I bought her. I had breakfast at the Heathman Hotel with my friend Melethia this morning and showed her the painting online. She started laughing too. She liked the guinea pig's feet. It made her feel good just to look at this too. 1. I am not under the illusion that little things like the painting of a blue guinea pig will magically make me undepressed but I think if enough little happy things fill my day that they will add up to changing my mood. 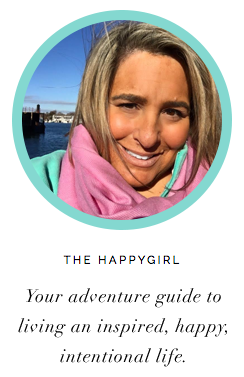 This whole experiment is about being 'the girl who got her happy back' and if looking at a blue guinea pig or tanning or getting a pedicure makes you feel better than take that step. Take a little step. If it makes you feel better for five minutes than at least it is something that breaks the depression or the malaise or the angst. 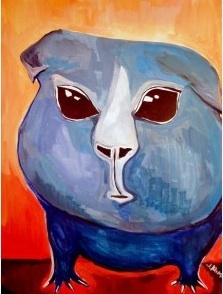 Buy the blue guinea pig. 2. If you see something you love, get it then and there. When I was little girl I remember going to Vermont with my mom and her friends. We were in a general store and she found a bread she liked. It was the only one and she picked it up, put it down and looked at a sweater vest behind her. Well, someone came along and picked up that damn bread. It was as if someone had taken her only child. My mother was fit to be tied and darn it all if we didn't hear about that bread all afternoon on the long drive home. It became a legend it our family. If you like something, pick it up or someone will steal your bread. I'm going to the mailbox now. Hoping that I've got a little blue guinea pig in there just waiting for me.